by Ming in Summer 2013. Here is our webpage showing the research we have been working on. The main focus of our 'Laboratory of Advanced Microfluidic Systems (LAMS)' is on microfluidics, yet we are also interested in problems related to cell biology, biomechanics and biomedical instrumentation. We are a group of people who like to build and try new stuffs. Therefore, our fundamental research style is lying between engineering and science. More specifically, we often apply engineering knowledge to discover/solve scientific problems. Here is the record of our learning and achievements. Hopefully, our members will find their future directions (not necessarily in academia) during the moment they are in LAMS. Hope that you will appreciate our research described here. And for sure, a lot more are coming out! (Left, top to bottom) Ya, Yohannes, Chengpeng, Vincent, Dinglong and Shuhuan. (Right, top to bottom) Baoce, Arthur, Ray and Sihua -- Dec. 14, 2016. -- Dr Sun and Ray celebrate the success of Sun's defense presentation at the Peninsula Hotel. -- Baoce has finished his defense presentation. Congratulations, Dr Sun! -- We have our farewell lunch for Sihua. Thank you for your great efforts of helping our team! We wish you a successful future career! -- Chengpeng and Baoce are presenting their projects in the 2016 Materials Research Society (MRS) Fall Meeting and Exhibit, in Boston, Massachusetts. They must be having a very fruitful trip! -- Chengpeng and Shuhuan attended the the 10th IEEE International Conference on Nano/Molecular Medicine and Engineering (IEEE Nanomed). 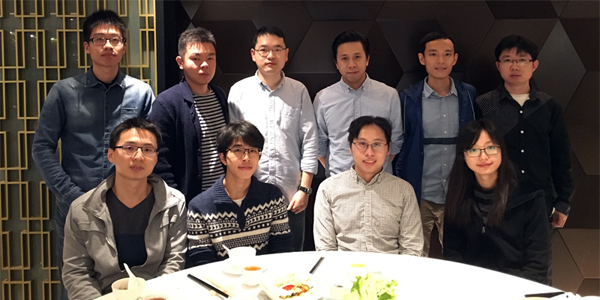 Contragulations to Chengpeng of winning the Best Student Paper Award and Shuhuan went to the finalist of the same award. You guys are awesome. I am very happy as these achievements represent your own research capability.! -- Dinglong, Shuhuan and Allen have been awarded with the Outstanding Academic Performance Award and Research Tuition Scholarship by City University of Hong Kong. Congratulations! -- Baoce and Yohannes are presenting their works in the 16th IEEE International Conference on Nanotechnology (IEEE NANO) held in in Sendai, Japan. Hope that their will learn a lot from other top experts in the field! -- We have our farewell lunch for Donald. We thank Donald for always helping us on the EEG system as well as other electronics related tasks! Hope you will have a great graduate study in the following year! -- The final year project of Angelie, Eva and Tody has been selected in the finalist of the IEEE EMBS Hong Kong-Macau Joint Chapter Student Competition 2016. Great job! -- Sihua is representing our EEG system team to present our progress in the 24th Annual International Conference on Composites and Nano Engineering held in Hainan Island, China. Hope you enjoy the trip and get the taste of academia, Sihua! 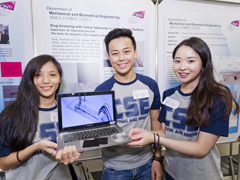 -- Our final year project students Eva, Angelie and Toby are presenting their project about a microfluidic drug toxicity assay in the City Unviersity of Hong Kong College of Science and Engineering Discovery and Innovation Gala 2016. I am proud of them, as they came up with the idea themselves and finished the project perfectly! -- On the other hand, we have a booth promoting our ambulatory EEG system in the same event, too. 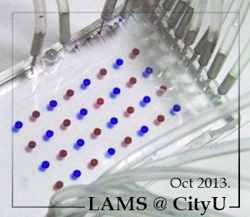 -- Ya is presenting at the International Conference of Microfluidics, Nanofluidics and Lab-on-a-chip held in Dalian, China. You are having a good achievement to have some fantastic work in your first PhD year, Ya! -- Yohannes is attending and presenting his work in the 12th International Conference on Modern Building Materials, Stuctures and Techniques (MBMST) held in in Vilnius, Lithuania. He should be having a great experience. -- We have our 'end of the academic year' lunch gathering with a nice Japanese hotpot buffet. Thanks Sihua for the organization, as always. Summer is coming, yeay! -- We have a booth promoting our ambulatory EEG system in the Hong Kong Trade Development Council (HKTDC) Hong Kong International Medical Devices and Supplies Fair 2016 in Hong Knog Exhibition Center. -- Congratulations to Binbin, Hei and Arthur! You guys have done a good job with a great achievement of the Second Prize in the IEEE Hong Kong Section Student Paper Contest 2015 (undergraduate section). We are proud of you guys! -- Xin, Dinlong and Ray are attending the ASME MNHMT conference in Singapore! Nice presentations, Xin and Dinglong! 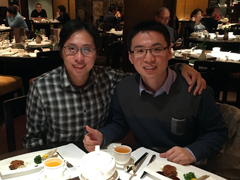 Dr. Baoce Sun (right) and Ray (left) at Spring Moon in The Peninsula Hotel for celebrating Dr. Sun's recent successful defense presentation. -- Jan 7, 2017. (Left to right) Angelie, Toby and Eva presenting their workins in the CityU CSE Discovery and Innovation Gala. -- Jun 22, 2016. 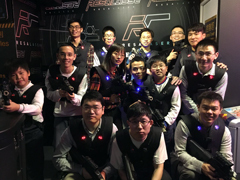 (Upper row: left to right) Xin, Ya, Ray, Baoce and Allen. (Middle row: left to right) Hugo (new member! ), Dinglong, Sihua, Weijin, Oscar (new member!) and Donald. (Lower row: left to right) Chengpeng, Shuhuan and Yohannes. Taken after our war game. Everyone is the hero today!. -- Jan 22, 2016. Copyright© 2011 - 2013 LAMS Research. All Rights Reserved.